The difference between a magnificent work of art and an illustration lies in the artist’s passion for the subject at hand. 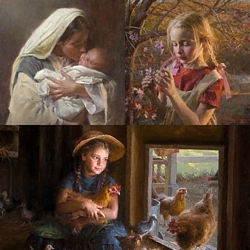 Such is the case with the power of Morgan Weistling’s Christian art. “This painting is a portrait of prayer,” says artist Morgan Weistling, “and its title comes from that moment in the Garden of Gethsemane (Matt 26:39), hours before his crucifixion.